First Step: What Am I Doing Here? This scene could be from any college. It the point during Orientation when students make their goodbyes to the parents and the Second Big Transition can begin. Sociologically, the First Big Transition occurs when students leave home for the structured bureaucratic environment we call public school. (Doesn’t quite work for you homeschoolers). The Third Big Transition comes as students anticipate leaving college for to pursue their futures. But in this moment, after the hugs and the tears, things are different. The student is in college, ready to make her way in this new environment. In many ways, the bureaucratic approach to education presents a major challenge to learning. We make school about putting in seat time, meeting due dates, doing busy work, and waiting for the end of the period/course/semester/graduation. And that’s just the case for faculty — imagine what it feels like for the students! When we make education equivalent to a production line, we rarely stop to reflect on what we’re doing. In my experience, the students pictured above aren’t really clear on why they’ve even come to college. 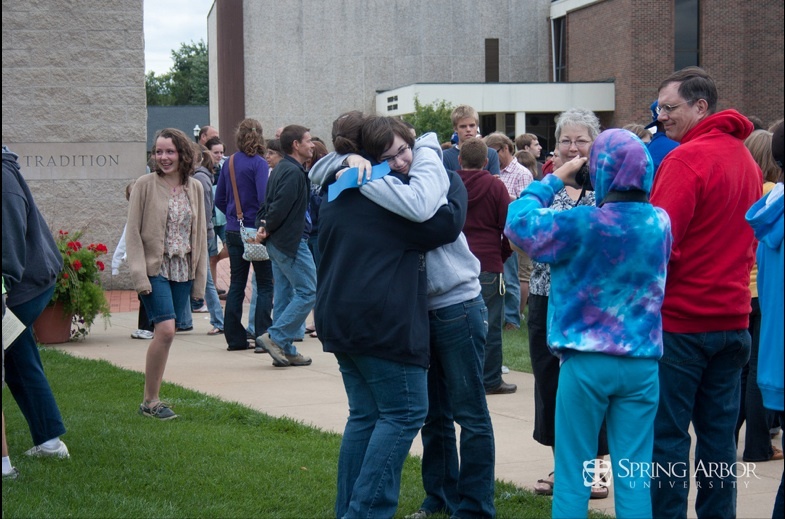 More likely, they have a number of conflicting ideas and part of the challenge of the Christian university is to help them navigate that conflict. The second chapter of the book considers the student who may well have been carried along by the momentum of the educational system. Having decided she was college-bound early in life, suddenly the day has arrived. She runs the risk of continuing to go through the motions, checking off the prerequisites, and racking up the right number of credits arranged in the right way. It’s possible for her to go through four years of college experience and not really get much out of it. We build systems for tracking her progress and making sure she doesn’t quit along the way. This is good, but we don’t want to settle for smoothly running systems. What we’re doing is more important than that. There are four potential reasons students may have selected any particular Christian university. The first is the bureaucratic one I’ve just described: “it seemed like the next thing to do“. That’s not wrong. It’s just not enough to carry them over the ebbs and flows of the next four years. The second reason is screamed across newspaper and internet pages: “I need a Job!” Over the last thirty years, we have increasingly made higher education into a commodity that one cashes in for future opportunities. I’m not denying that graduates need to support themselves. But the vague idea that college graduates can’t find jobs just isn’t reflected in the data. Surveys regularly show that employers desire workers with the critical thinking and communication skills that accompanies liberal arts education. Even in the depths of the Great Recession, the unemployment rate for college graduates was well below their counterparts with only a high school diploma. By nearly any measure, money spent on college provides a significant return on investment. Based on estimates by census department analysts, a college graduate has an advantage in lifetime earnings of over $850,000 for women and $1.1 Million for men. Even with our concerns about college debt, this is a good deal when seen from a long-term perspective. Besides, we are preparing students for careers (even if they switch jobs frequently) and not for the first job out of college. It’s important but it’s not the key reason for what we do. Some students have selected a Christian university for its secure environment, my third reason. This has both positive and negative elements. The positive version is that students want a school that honors their faith commitments, provides chapel music opportunities, opens the possibility of finding a Christian mate. This proves slightly more difficult than they might think, as later chapters discuss. The negative view has to do with biases about large state schools with questionable reputations. Perhaps there will be faculty that will ridicule people of faith. Perhaps the roommate will belittle one’s experience. And then there are the parties, and the drinking, and the perception (which recent data is questioning) of the hook-up culture. These students will also have some adjustments as they’ll have their faith engaged, they’ll find people who party and hook-up, and struggle with the roommate (even though both claim to be Christians). The fourth reason for college has to do with finding one’s place in the larger context of God’s creation. Students coming to college, as my friend Lou put it, understand that they are taking 41 courses in self. It’s not about self-satisfaction (leave the narcissism comments aside) but about self-fulfillment. Who are they called to be and how do their educational experiences enable them to pursue that calling? This is the one of the four answers that most contributes to the building of God’s Kingdom and to the unique expression of life in a Christian university. In fact, I argue that if you start with the fourth reason and pursue it passionately, getting the job isn’t a problem. Navigating the various and sundry freedoms of college life is more manageable. You’re less likely to drop out, lose your way, struggle academically, or take a bunch of extra credits. Start with meaning first, and all the rest lines up. Media concerns about jobs notwithstanding, students understand the interplay between these reasons for college. They always have. Every year the Higher Ed Research Institute at UCLA gathers data on incoming freshmen. They ask questions about student motivation in terms of their college experience. This is the HERI data going back nearly 40 years. While it’s true that the Great Recession has made jobs a higher priority, general education and liberal arts are still mentioned by 70% of students. They also want to make money and get better jobs. But meaning is not separate from these other endeavors. When students can affirm that they are learning in preparation for who they’re called to be, all the other things will fall into place.